Midorima often acts reserved, mean, and brusque with others, coming off as arrogant—although Takao claims Midorima is just "tsundere." He has a hard time acting kind to his opponents and generally hates "fooling around" (although Takao often pursues him into it). He can be seen, at all times, with a lucky item due to his strong belief and passion for horoscope. He is left-handed, and always bandages his dominant hand outside of matches (claiming that his hand must be in perfect condition so nothing will influence his shot). He also shapes his nails so that his hands will be in perfect form for shooting. 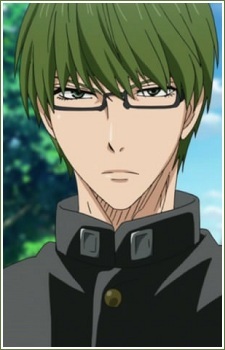 Formerly a member of the basketball team of Teikou Middle School, Midorima is a member of the Generation of Miracles (Kiseki no Sedai); during his time with Teikou, his jersey number was seven, switching to six as he joined Shūtoku's. He also served as a vice-captain under Akashi.